My moms favourite dessert is Crème Brûlée, so when I found out that Mari at Mevrouw Cupcake picked Crème Brûlée at page 393 of Baking: From My Home to Yours as this weeks recipe I knew I would make my mom a very happy camper. 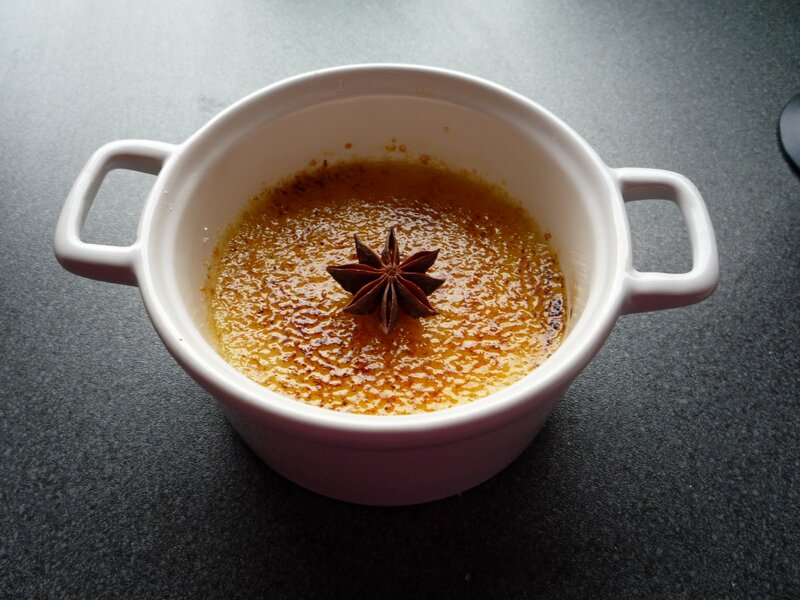 This was my first attempt at making Crème Brûlée, so I thought (as if it wasn’t enough challenge already to make my first Crème Brûlée) I would try something a little bit different: a Crème Brûlée with Star Anise and White Chocolate. To do this I followed Dorie’s directions on how to infuse the flavour of a herb or spice into the Crème Brûlée, so I dropped 8 star anises into the milk and cream, brought that to a boil, took the pan of the fire and let the mixture sit and infuse for 30 to 60 minutes. I let it sit for the full hour, then I removed the star anise and brought the mixture to a boil again. After that I took the mixture of the fire and stirred in 100 grams of white chocolate chips so that they would melt. 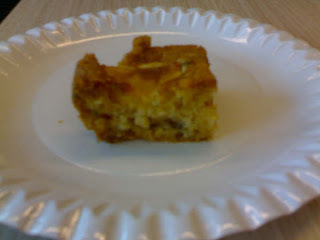 Then I continued with the normal recipe, which can be found at Mari’s blog. I let the Crème Brûlées sit in the oven for the full 60 minutes. 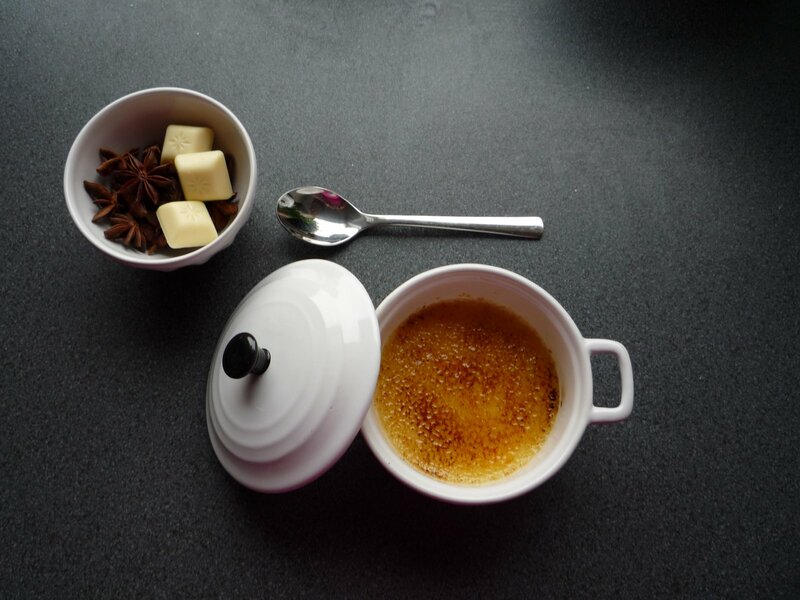 My mom gave this recipe a big thumbs up.I loved the crème brûlée: the texture was perfect, the taste of the star anise was very subtle, maybe a bit too subtle, and the chocolate seemed to make the Crème Brûlée even more creamt. I did think it to was very sweet: I should have used less sugar in the crème brûlée because I put in the white chocolate…. Oops!! I will definetely be making this recipe again, although with a little bit less sugar and a little bit more star anise. Dad’s verdict: 7 out of 10. P.S. What do you think about my pictures? I bought my new camera last Thursday and I absolutely love it!! It’s a simple point and shoot: a Panasonic FS-5. If you want check on my fellow-bloggers, go to TWD! >Okay, I promise: this will be the last list you’ll see appearing on my blog this month!! But again: it’s about desserts and so I just had to check if I had more from this list than last list! This one was found at ReTorte. 1. Bold what you’ve tried. 2. * What you’ve made. 3. Cross out what you wouldn’t like. 4. Italicize something you’ve tried but didn’t like. 14. Creme Brulee* Well, okay I haven’t actually made it yet, but I will make it this weekend for TWD!! So I think that counts! Out of this list I tried 44 desserts…. More than on last list, but still plenty of desserts to try! >This list was found at Cakespy and since I love anything sweet I knew I had to do this list!! 2) Bold all of the sweets you’ve eaten! 5) Optional: Post a comment here linking to your results. So far I have tried 33 of the above… Overall pretty good, don’t you think? Please let me know how many you have tried!! >This week Michelle of Bake-en chose the Dimply Plum Cake for our TWD challenge. Since I’m not a huge fan of plums or peaches I hesitated about participating. In the end I decided I would actually make this cake and I’m so happy I did!! The cake was delicious!! I bought some yellow plums at the market, I quartered them and used lemon zest instead of orange. I bought a basil plant 2 months ago and it’s still alive, which is a miracle on it’s own as I don’t have green fingers…. So far all the plants I had died in recordtime: either because they drown in water or because they get dehydrated by lack of water…… Since this basil plant is still very much alive and kicking I decided to add some of it to the cake. After 40 minutes the cake was not quite done, so I left it in the oven for another 10 minutes. The first bite was sour and than it turned sweet, a scrumptious combination!! I really don’t understand where the tartness comes from…. I tasted the plums beforehand and they were sweet. After baking they tasted a bit bitter. Dad’s verdict: 8 out of 10. P.S. More crappy pictures this week, but it’s probably the last time: I just got a letter from the insurance company and they are going to reimburse me for my broken camera!! So it’s shopping time!!! Does anyone have some tips for which camera I should buy??? >Another list – of books this time!! >I love to read and I love lists (as you may have read in my blog earlier), so when I came across this one at Butterbur’s Bistro I had to post it on here!! So I have read 33 of the books on this list…. Hmmmm… Is this good or bad??? Oh my God!!! That’s my first reaction after tasting these cookies. If like cookies, you’re going to love these cookies! If you’re a chocoholic, you’re really going to love these cookies! If you’re a browniedan, you’re definetely going to love these cookies! Thank you Claudia of Fool for Food, for picking this recipe! Since I get a headache from bittersweet chocolate I only used this for the melting chocolate part. For the chunks of chocolate in these Chunkers I used milk chocolate and white chocolate. Besides all of the chocolate I also opted to use pecans and golden raisins. I must admit: I had my worries when I saw the batter after adding all the chocolate, pecans and raisins. 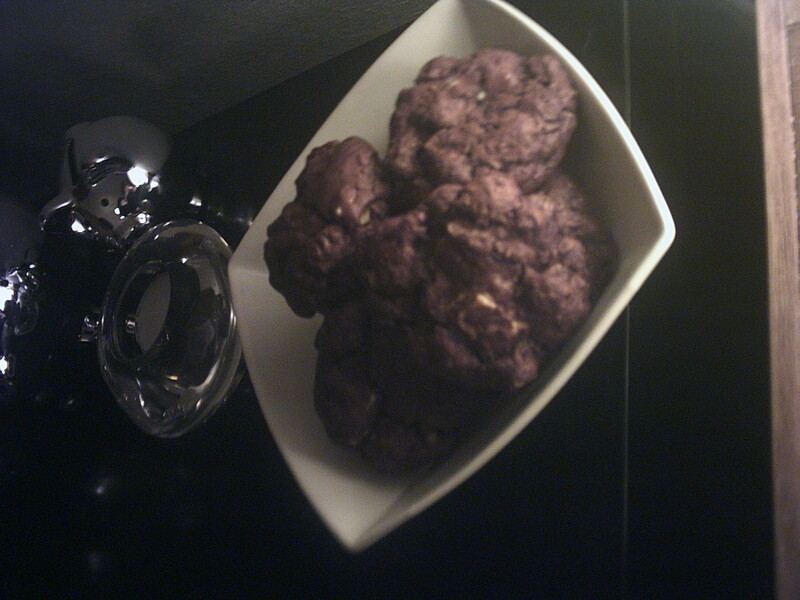 I couldn’t imagine that this lumpy mess would be cookies that would hold their shape. But they turned out great!! Check out the results of my co-bakers at TWD. If you want to start making these wonderful recipes, please consider buying Baking:From My Home to Yours by Dorie Greenspan. So far it is the best cookbook that I have bought!! Dad’s verdict: 9,5 out of 10. N.B. Out of all the pictures I took only one is OK enough to be published…. But still crappy!!! So first this recipe had me searching all over the Internet to find out what Whoppers are. Here in Holland Whoppers are Hamburges you can buy at Burger King, but I was sure this had nothing to do with cookies… Finally I found out that Whoppers are similar to Maltesers, fortunately those are available in Holland!! On to the next one: what the *%$# is Malted Milk? I had never heared of it before… Another look at the TWD site informed me that I could also use Nesquik, so that’s what I looked for in the supermarket. Three different kinds of Nesquik??? Chocolate, strawberry and banana?? I thought banana would be a great combo with all the chocolate that would be used, so on I went to the cash register. With all the ingredients sought out and at home I could finally start baking. This recipe is really easy, and must be fun to make with your kids (because I don’t have kids, I wasn’t able to test this idea….) 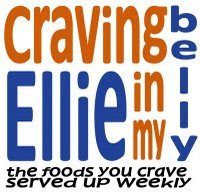 I substituted half of the bittersweet chocolate with milk chocolate, simply because I’m not a huge fan of bittersweet chocolate: I find that it is overpowering and it also gives me migraines…. These cookies are very very nice: cakelike and fluffy in the center with crunchy edges, the banana taste was nice and subtle. I couldn’t find any Maltesers in the cookies though, I must have cut them too small: next time I’ll just halve them.